As a manufacturer, Jam is doing a pretty good job keeping our attention. That is to say, they’re good at making products that look and feel cool very much in the style of Beats or other prestige brands. What they aren’t doing, unfortunately, is making true wireless earbuds that stand up to the likes of current generation true wireless newcomers like Mifo. That said, the Jam Live true wireless earbuds have their charms, and for the nearly $100.00 sticker price we expect them to have a few tricks up their sleeves. Jam Live true wireless earbuds get points for style, but lose in other key areas less expensive brands have mastered. It’s hard to hate the peppy, color and texture forward Jam brand. As one of the first really innovative visual styles from the era that brought us Skullcandy and Beats by Dre, Jam knows how to wrap things in a pretty package. Indeed, Jam products are like audio for grownups without the price tag of Bang & Olufsen or Bose. It’s a cool young adult, straying far from dad’s headphones. And if that style speaks to you, the Jam Live true wireless earbuds should fit the bill nicely. The textured, cloth-wrapped exterior is complemented by three inoffensive colors that add a touch of sophistication to the device. A similarly wrapped and styled battery case is included, offering more power when on the road. Features are standard and certainly not incomplete, but do not offer any redeeming or unique points aside from the visual styling. While you are on the go, taking calls happens with the tap of either the left or right earbud inset button. The magic quickly fades after that thanks to one of the major defects found in most true wireless earbuds that are not Apple’s AirPods or Jabra’s Elite True Wireless earbuds. The technical reason is placement of the microphone as well as software interpreting the sounds coming through. Most true wireless earbuds today offer a single microphone in one or both earbuds. Thanks to the position of this microphone relatively far from the speaker’s mouth and close in to the side of the head, they tend to pick up ambient noise just as well as the speaker. It gets very old very quickly, so if you are planning to use true wireless earbuds for frequent or important phone calls, go for a pair with multiple microphones and advanced beam forming technology that helps listen to the speaker and cuts out ambient noise. 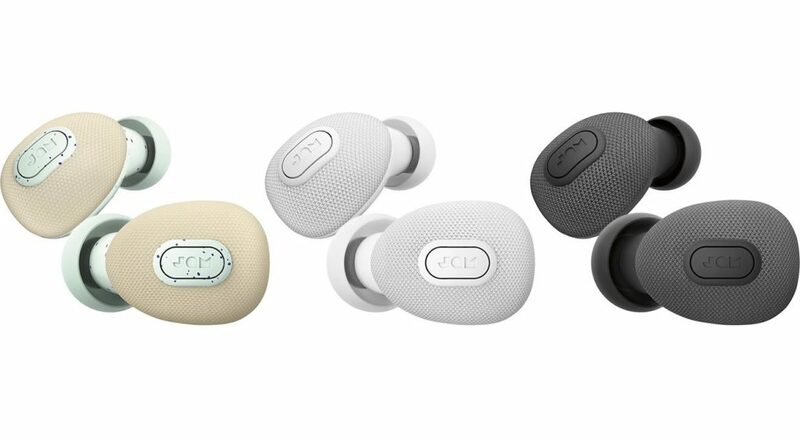 Jam Live offers a good representation of what stylish true wireless earbuds can look like, but are priced too high for modern standards. Battery life is lacking in the Jam Live true wireless earbuds. They are rated for a maximum of three hours of continuous use before needing a charge, but in reality end up getting between two and three, depending on what you are doing and where you have volume settings. That’s too bad, because today’s TWS earbuds using lower power Bluetooth 5 chipsets and larger, more efficient lithium polymer batteries are getting nearly eight hours of continuous use before needing a recharge, four times the capacity of the Jam Live true wireless earbuds. Speaking of Bluetooth chipsets, it’s worth noting the older Bluetooth 4.1 chipset contained in the Jam Live is getting dusty. While signal strength is fine, it isn’t great. True wireless earbuds require a delicate ballet of signal exchange between a source device, a master earbud, and a secondary or child earbud. Mess one part of the equation up with too much distance, software issues, or other impossible to control details and sound skips, stutters, or outright doesn’t work at all. Points for style. The Jam Live True Wireless Earbuds look and feel like a premium product. Simple, easy to user interface consists of one button on each earbud. Mediocre to bad battery life for the price. Older Bluetooth chipset means more interruptions and stuttering. Microphone placement on true wireless earbuds leaves a lot to be desired. Sound is fine, but not great. For the price, we expect more. Nicholas has worked in the world of marketing and communications for 20 years. He consults brands on digital marketing strategy and execution, helping concept and execute award-winning integrated campaigns integrating the latest technologies for ecommerce, digital media, and influencer marketing. He has worked with some of the world's best known brands including Visa, The Obama Foundation, Anheuser-Busch Inbev, Porsche, and Pepsi. He is a regular contributor to publications including AdWeek, Forbes, Businessweek, TheStreet, and more.